although we love desserts, we rarely eat candy. we're just not that into it, and most candies tend to be sickeningly sweet. however, we were intrigued when we came across holiday mint m&m's in the grocery store this season. we bought a bag thinking that it might be fun to mix them into a batch of christmas cookie dough. over the weekend we made several different types of christmas cookies. 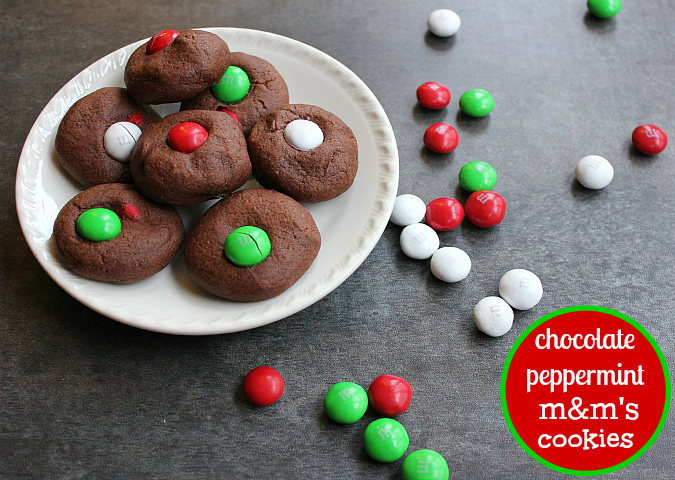 one of the types that we made was chocolate peppermint cookies with the holiday mint m&m's. 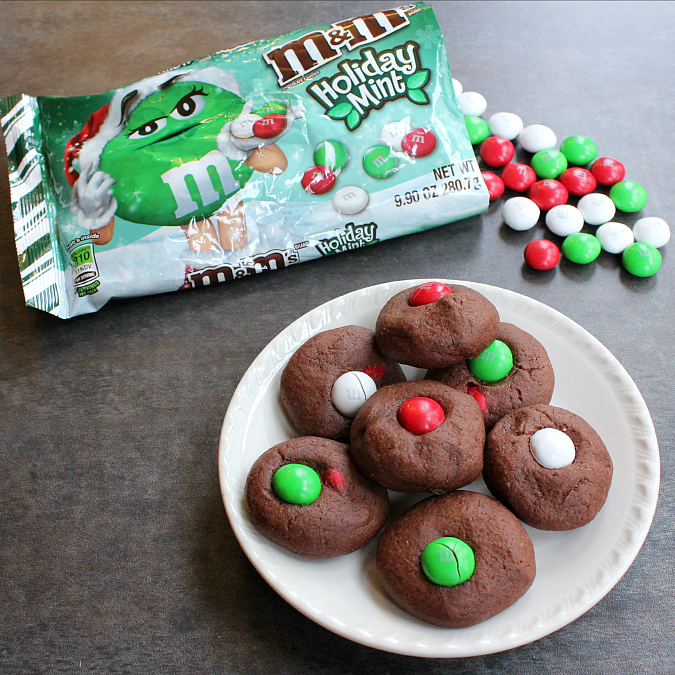 the combination of cocoa powder and peppermint extract gives the base of these cookies a great flavor, and the m&m's give them an extra burst of mint. 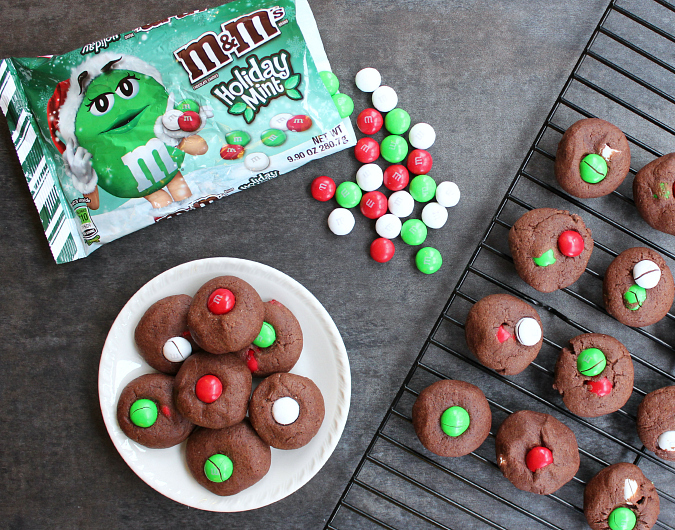 the red, white, and green m&m's are so festive and the colors really pop against the dark chocolate cookie. they are perfect for christmas time! preheat your oven to 350 degrees F and line a baking sheet with parchment paper. cream the butter in the bowl of a stand mixer fitted with a paddle attachment. add the granulated sugar and beat well until light and fluffy (about 3 minutes). beat in the egg. scrape down the bowl and mix in the cocoa powder until completely combined. add the flour and baking powder and mix until incorporated. fold in the m&m's. scoop 1 teaspoon-sized balls of cookie dough onto the cookie sheet. gently press the cookie dough balls down into discs. top with additional m&m's. bake for 10-12 minutes. once baked, allow the cookies to cool on the baking sheet for 5-10 minutes before transferring them to a wire rack to finish cooking completely.